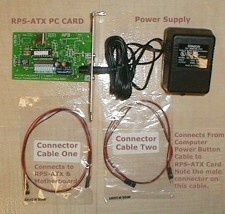 The RPS-ATX is a PC Card that is connected to the power pins on your ATX Motherboard. A separate power supply ( which is plugged into the same power source as your computer.) is connected to the RPS-ATX. When power is removed from the system, your system shuts down. When power returns, the RPS-ATX detects the return and automatically closes the connection to your power reset pins for 1 or 3 seconds. This restarts your computer just as if you ‘pushed the power on button’ for the system. The RPS-ATX only function is to push the power button when the power returns. It simply restarts your computer when power is detected to the RPS-ATX power supply. 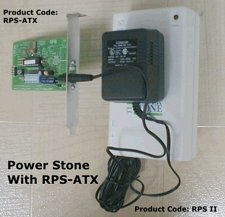 To remotely reboot your computer, use the RPS-ATX with our Power Stone RPS, (See Below ) which will allow you to reboot a ATX System remotely by telephoning the Power Stone RPS and initiating a power down/power up to the connected RPS-ATX power supply, thereby power up / rebooting your ATX System. Our RPS-ERP II Remote Power Control Unit will allow you to perform this same function over the internet using your web browser. How do I connect the RPS-ATX to my computer? The RPS-ATX PC Board contains 4 pins for power on/off operation. Also supplied is 2 cables. One connects to the RPS-ATX and the Power Button on your ATX Computer. The other from the RPS-ATX to the Power Pins on your ATX Motherboard. Installation requires you to open your computer, make the necessary connections, install the RPS-ATX PC Card and connect the power supply to the same power supply as your computer. If necessary, and to save a slot, the metal support bracket maybe removed from the card and velcro used to mount the unit inside your computer case. The transformer used with the unit has input requirements of 120V 60HZ 18W and supplies output of 9VAC 1000mA. My computer is being randomly powered down or resetting after I have installed the RPS-ATX unit. What is happening? 1) Go into your bios and make sure the power button control is not set for ‘Immediate Off’ when the power button is depressed. Instead set it for one of the other settings ( 10 second hold etc.) If a failure occurs to your computer, the power goes out. The RPS-ATX will function correctly when the power is restored by closing the contacts signalling the computer to start. Powering off the computer should not be a problem as you should have several options to stop the flow of electricity. 2) A brown out may cause the unit to detect removal of electricity. If possible, your configuration should make sure the power flow is available through a UPS with any remote activation devices placed after the UPS power supply. 3) If you have the RPS-ATX connected to your reset pins of the motherboard, try placing the connectors onto the power pins instead. This will give you greater control over the reboot functions of the computer. Most computers will work flawlessly with the RPS-ATX device and require no further ‘tweaking’. YES. Place your item in the shopping cart to determine shipping and handling fees. Well, there is not any! WE OFFER A 30 DAY MONEY BACK GUARANTEE and a ONE YEAR WARRANTY for orders shipped in the USA and CANADA! YES Click Here! For full information !